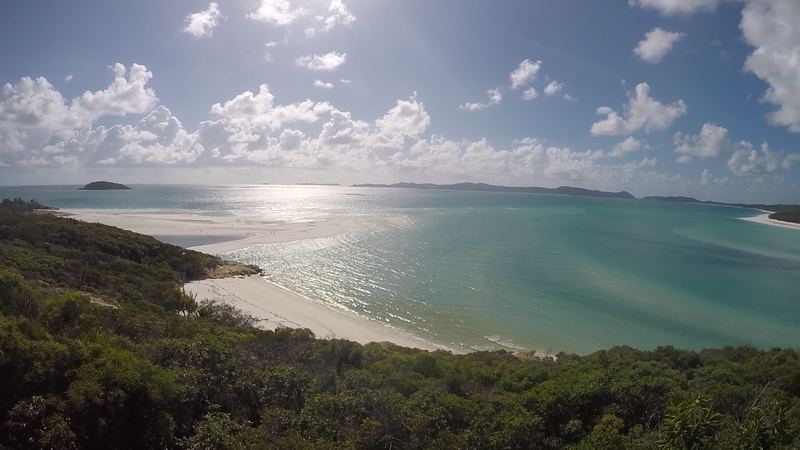 The Whitsundays are 74 islands off the east coast of Australia near to Airlie Beach, many of which are completely uninhabited. 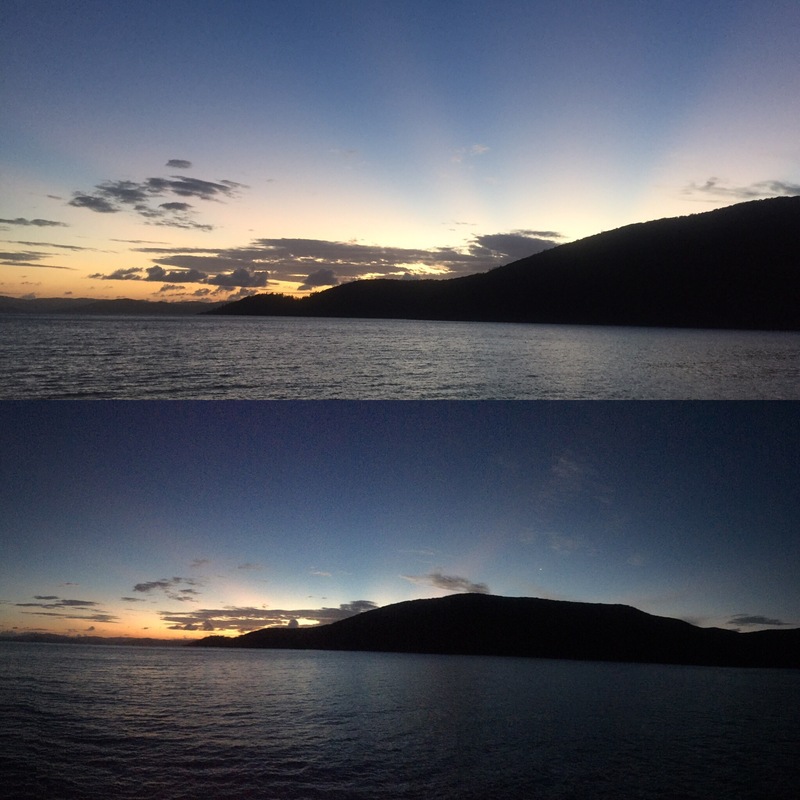 A Whitsundays boat trip is one of those things that all travel agents will ask you about when you pass them on the street and most travellers will ask you about when you’re nearing Airlie Beach. You’ll ask them what their boat is called and, after a while, you’ll stop being surprised when you haven’t heard of it – there are HUNDREDS to choose from. 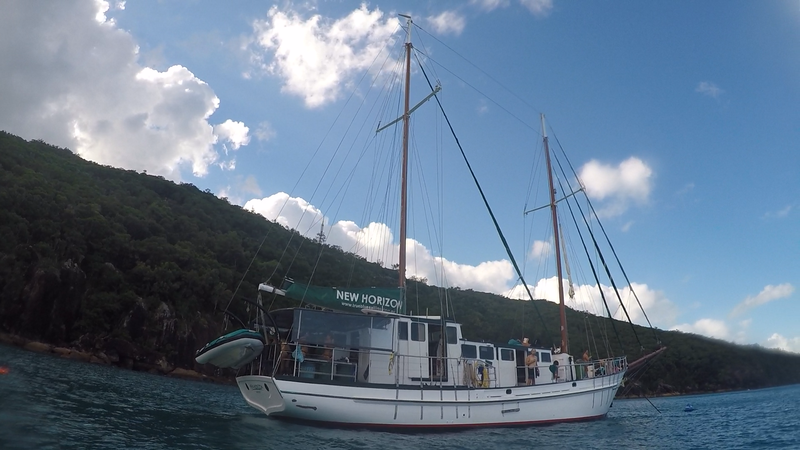 Our boat was called the New Horizon and we picked this one because we wanted a boat that would be up for a laugh and party but also be a bit more chilled during the day – also, it had a slide! You stay on the boat for 3 days, 2 nights. 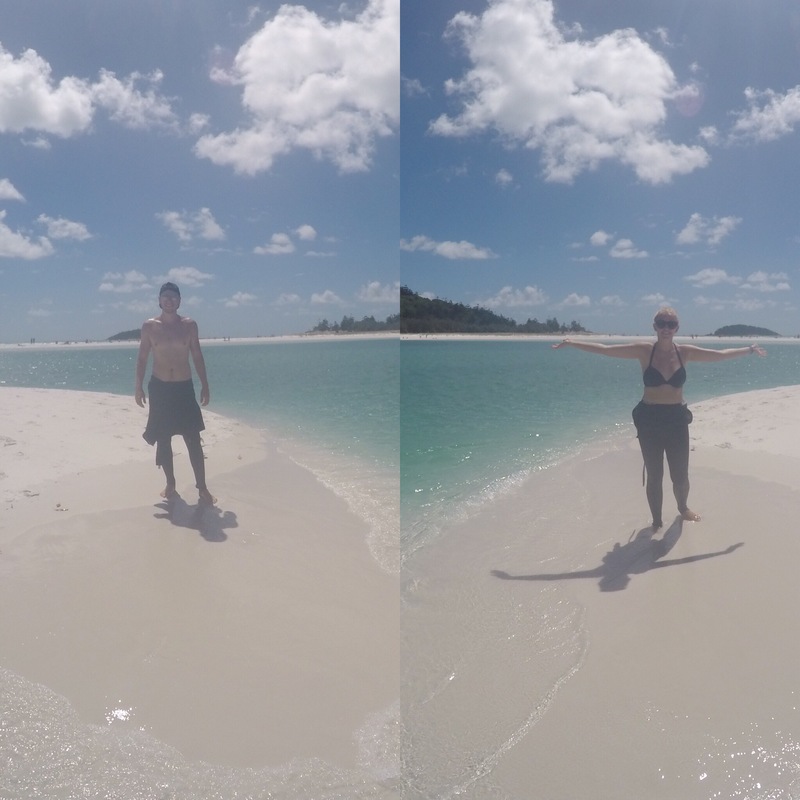 When we arrived to get onto our boat, we were surprised by the disproportion in genders. 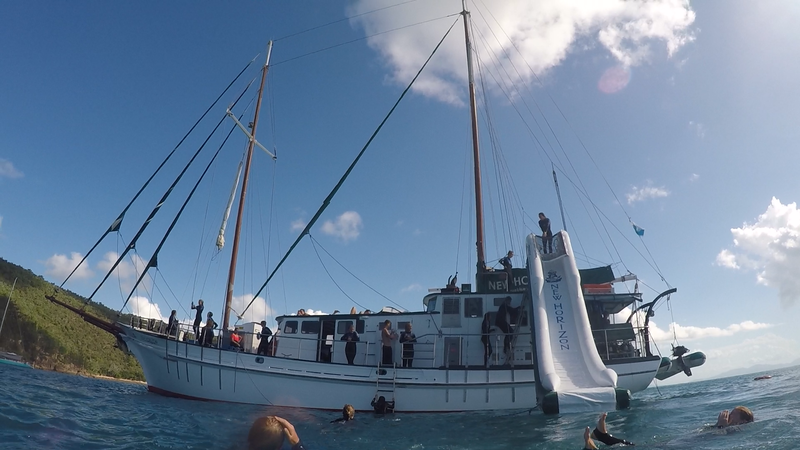 Of the 31 people on board, there were 4 boys including Niall – so not so great for him! We had noticed going up the east coast that there were a lot more females than males (who knows why) but hadn’t expected it for our boat trip. Nonetheless, it wasn’t going to ruin our time onboard. 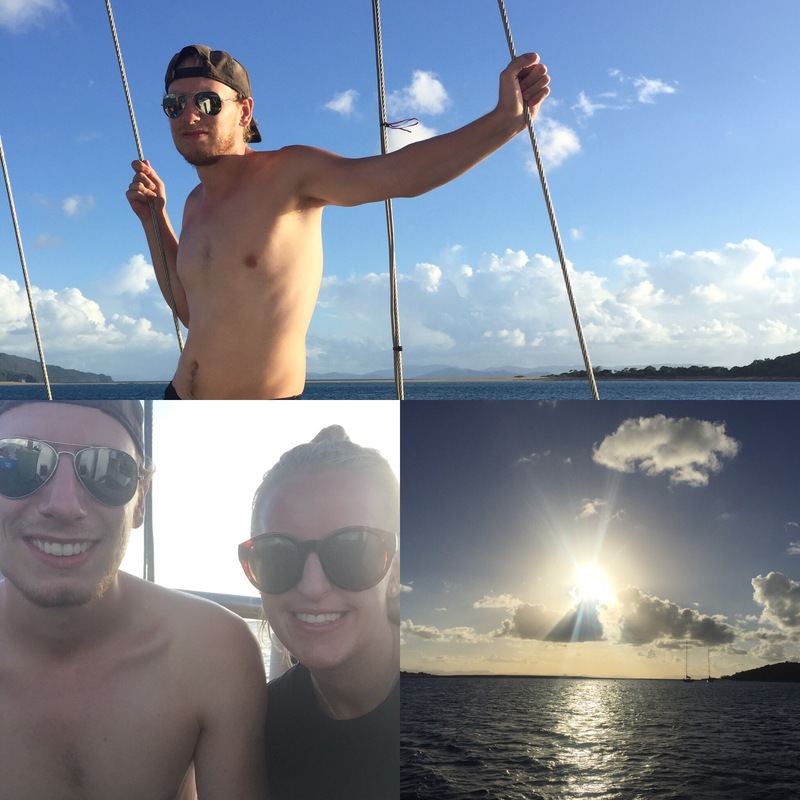 We didn’t get on the boat until 2pm and we spent most of that day sailing out to the Whitsunday Islands. 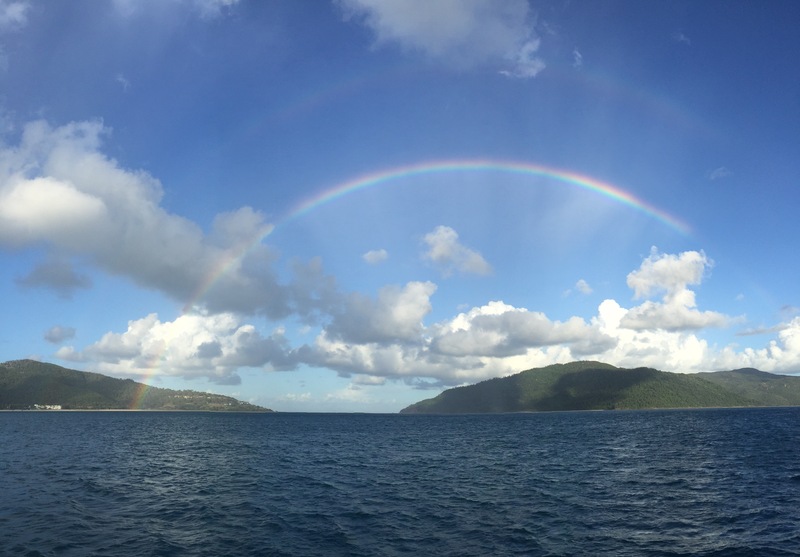 We sailed to the Nara Inlet which was a sheltered bay to protect us from any bad rain that night. The place was beautiful! 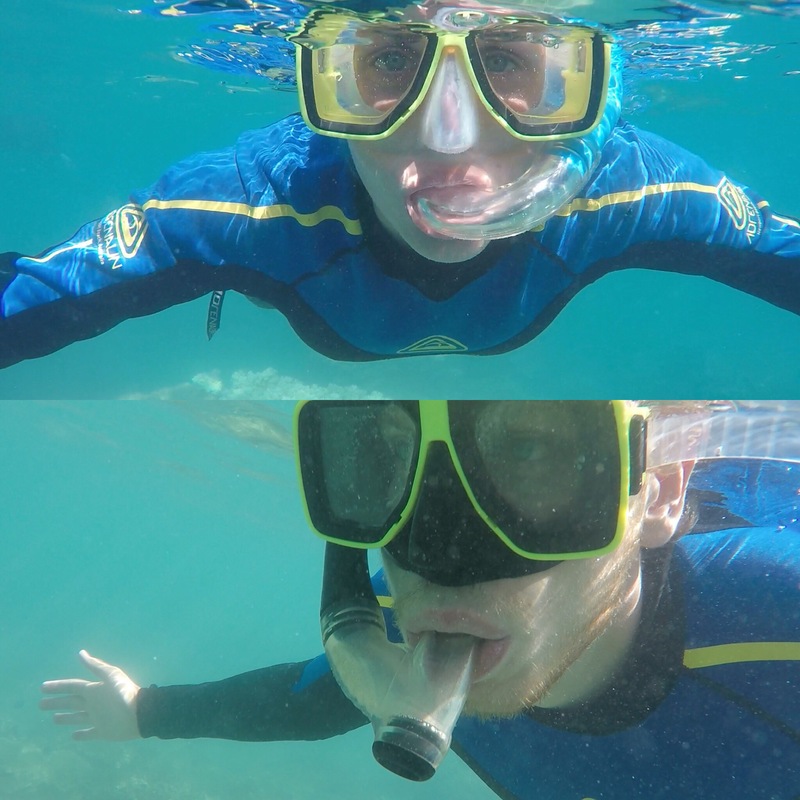 We docked up and put on our stinger suits (very thin wet suits to protect you from jellyfish – a must in Queensland sea) and had a swim. 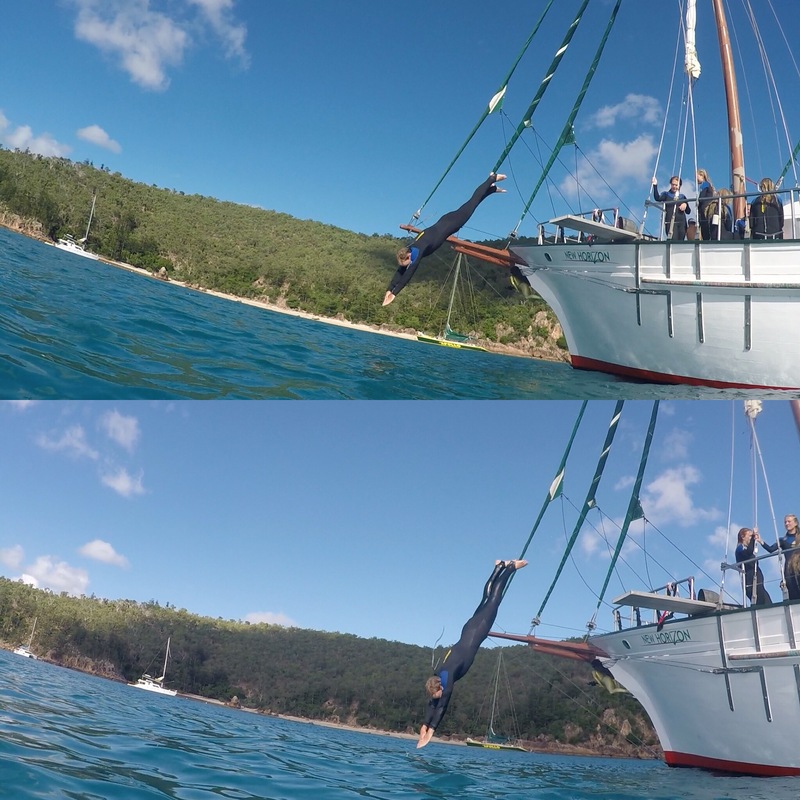 The boat had a diving board and so we all took turns jumping into the water. That night we had a really nice tea of fish, veg and a great mash potato. We then started drinking and getting to know each other as the sun set. Once it was dark the boat had lights so we could all see on the deck and this meant that fish came to the boat as they were attracted by the light. 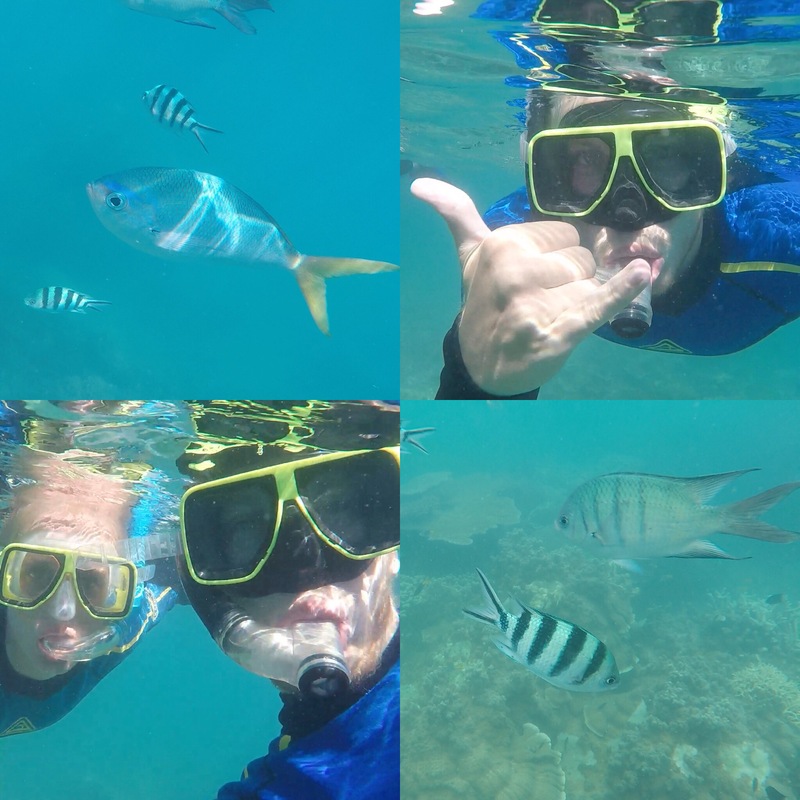 You could see the fish swim around and then we saw dolphins! The most amazing thing of the night was seeing a mother with her baby dolphin along side her. The crew said they hadn’t seen that before and especially not so close to the boat so we were really lucky! It really was incredible seeing the dolphins so close and had all of us very excited. The rest of the night we just chatted and drank. Most people went to bed around 10ish but me and Niall stayed up later until around 1am. 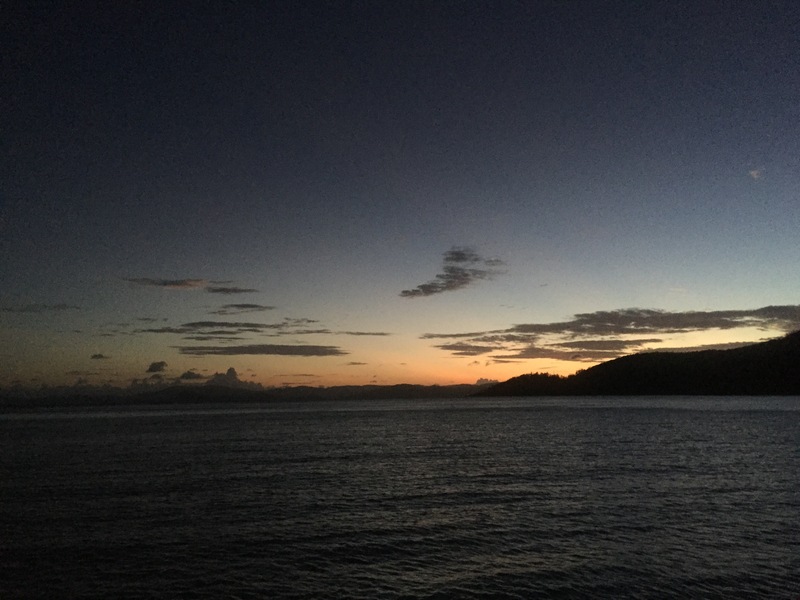 When everyone was in bed and all the lights were off on the boat you could see so many stars and there was also phytoplankton which glistened as the fish were eating and swimming around it – it was so cool! It was quite cool sleeping in the boat. We were in a cabin with around 10 other people and we had a double bed which was really comfy. We were also one of the few boats with air conditioning in the cabins (or so they said) so you never got too hot down in the boat – thank goodness! We were up at 6:30am for breakfast which was accompanied by a great morning welcome from some sea turtles. 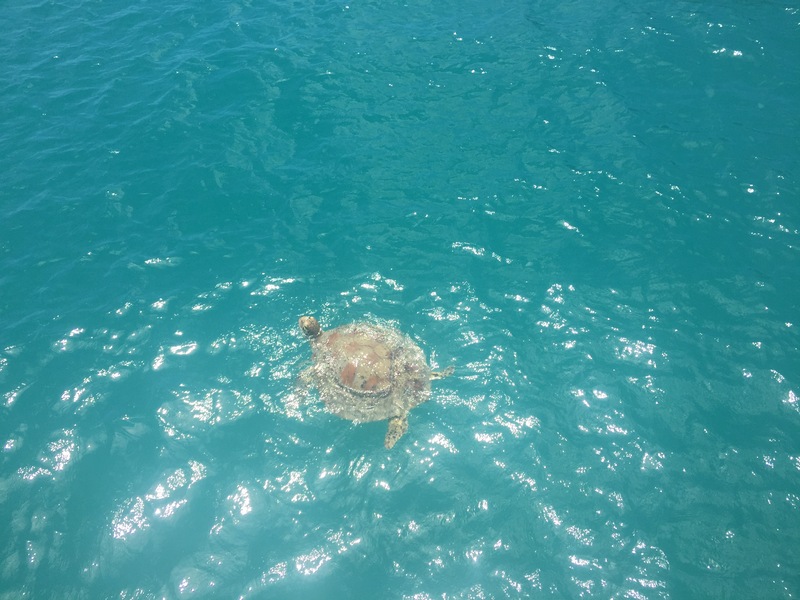 The turtles were so near the boat and so beautiful in the turquoise water, it was great to see. 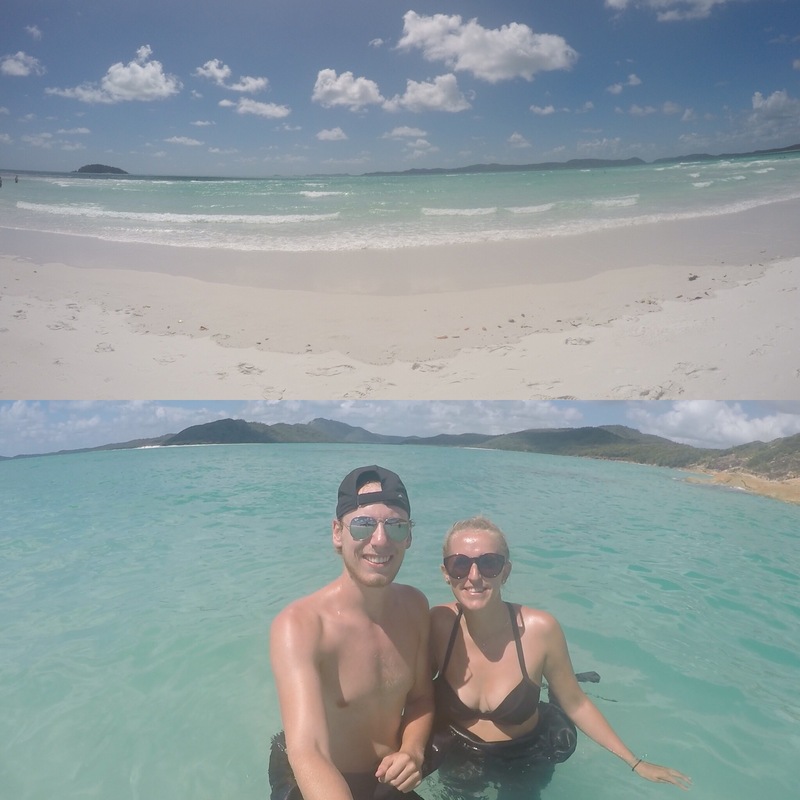 Our first stop for the day was also the most famous: Whitehaven Beach. 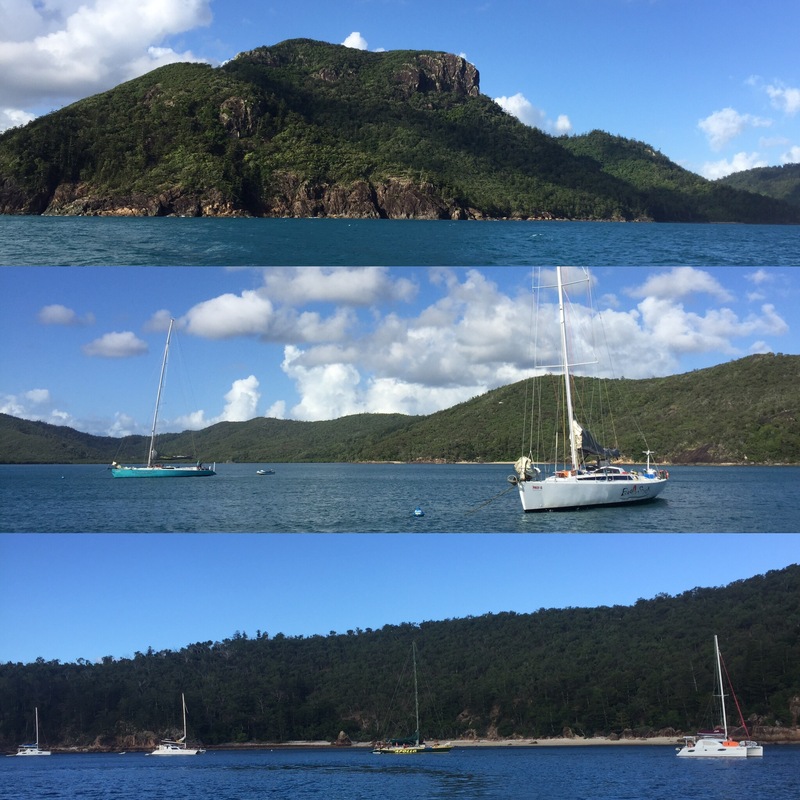 We docked in Tongue Bay where we saw more turtles and got a smaller boat over to the island. 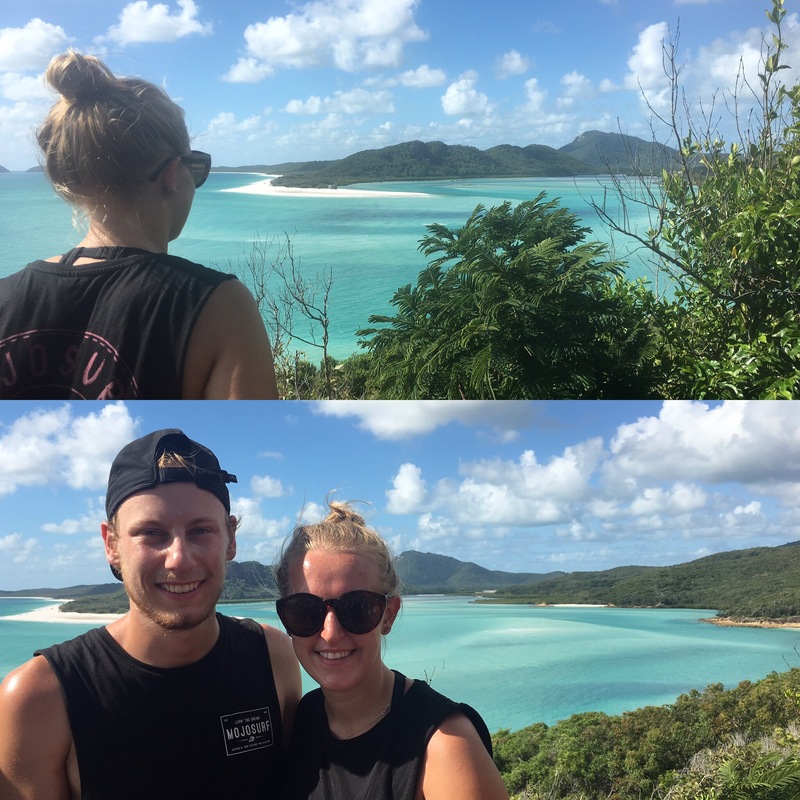 We were taken to a lookout at Hill Inlet which gave you incredible views of Whitehaven and showed beautiful patterns in the sand for miles – pictures don’t show it’s true beauty. From the lookout we walked through the forest onto the beach. It was stunning. The sand it really fine and it’s actually protected so that you get huge fines if you were caught taking any of it away with you! We got to spend a couple of hours here and, although it was cloudy, the sun would shine through the clouds and show you just how beautiful the beach could be. 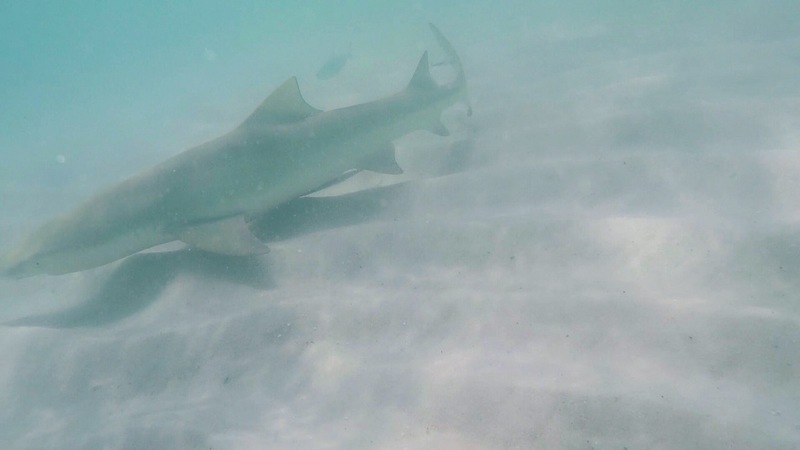 A highlight whilst we were there was seeing baby lemon sharks. When you stood in the shallows these baby sharks would swim past you and you could follow them around (if they weren’t swimming too fast!) I don’t have a picture of it because it was hard to make out with my camera but the tops of the sharks were bright yellow (hence the name) which, to me, made it all seem more tropical and exciting to see them. 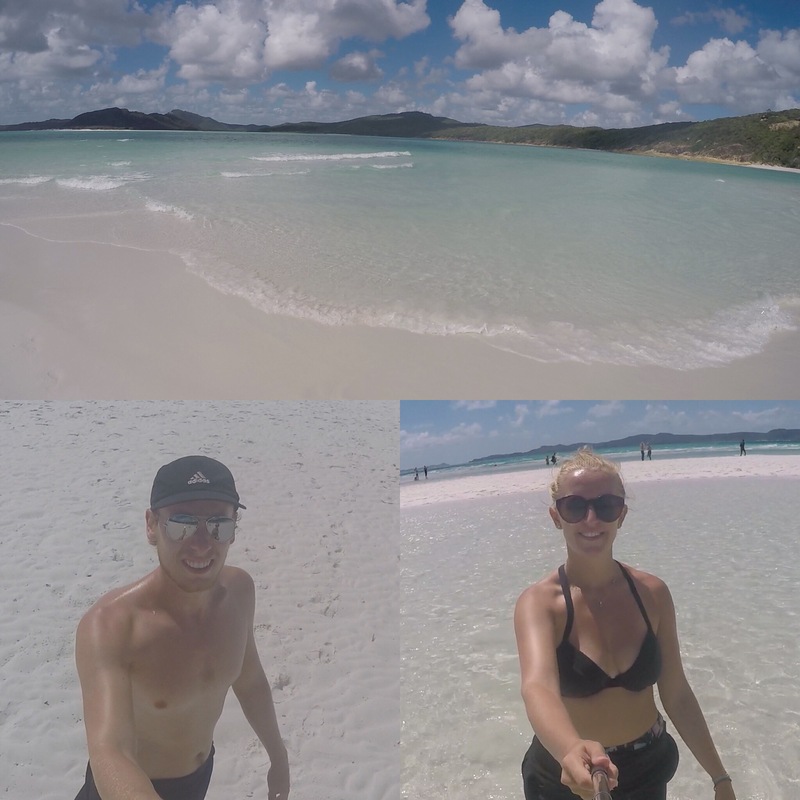 It’s hard to describe it but Whitehaven is a must see even if you just do a day trip to get there. It’s stunning and peaceful and you won’t ever regret going there. 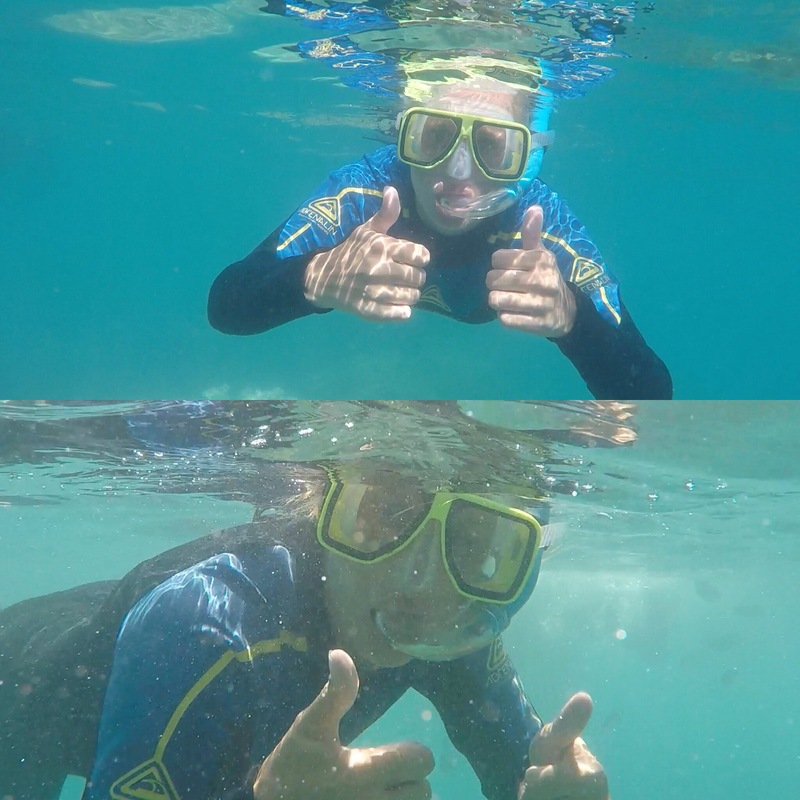 After Whitehaven, we sailed to a bay for snorkelling. 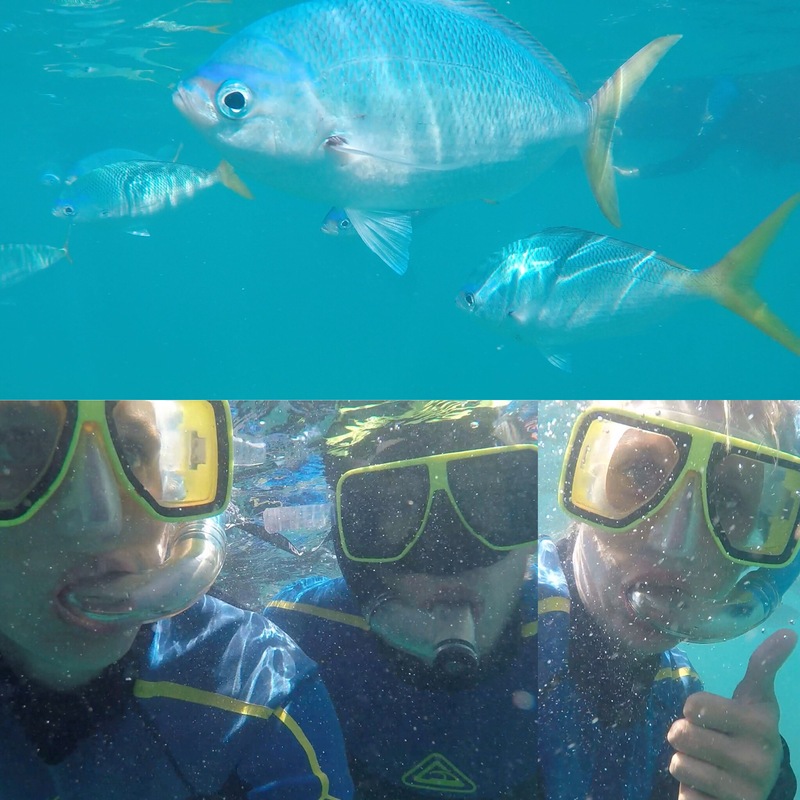 As soon as you got off the boat you we’re surrounded by big blue fish with yellow tails and the whole area was full of different fish which was just amazing. 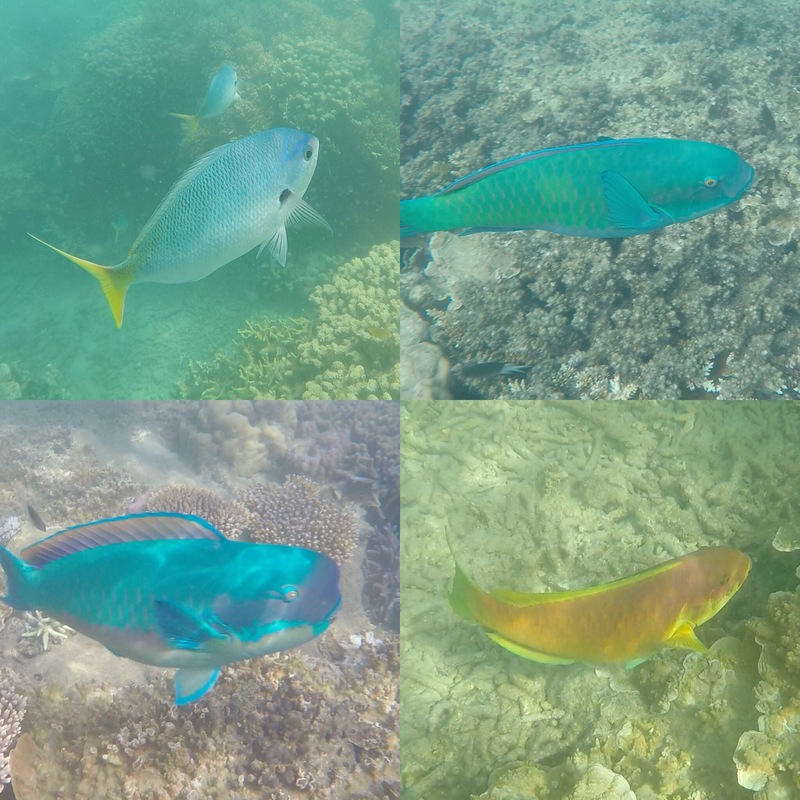 I love fish and the sea as it is but seeing it so clear and full of life was better than I’d ever seen before. 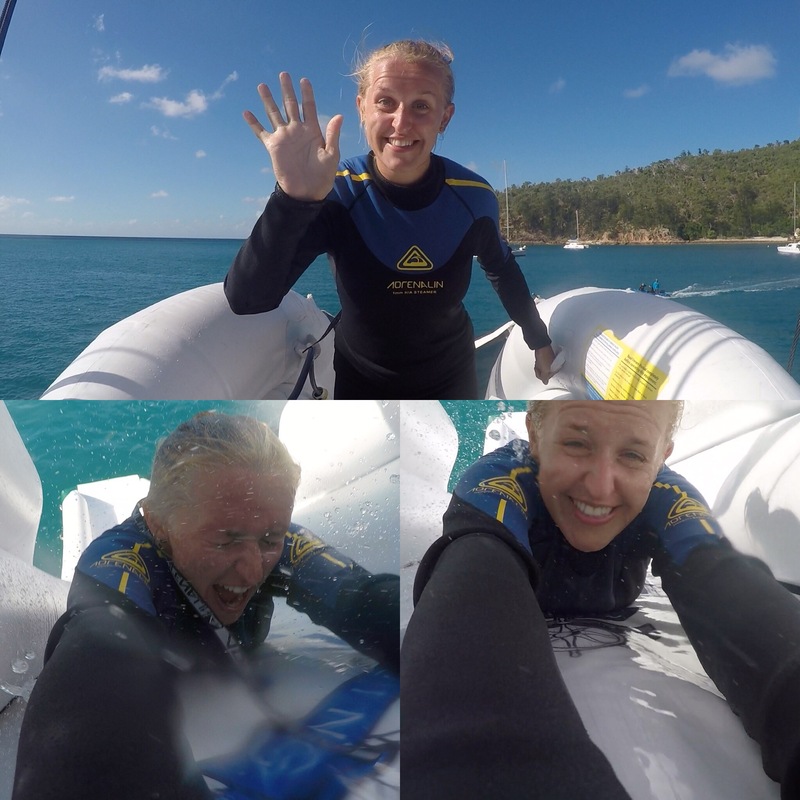 We bumped into our friend Jess who was on another boat – The British Defender – when we were snorkelling! Our boat then put up the inflatable slide and got out the paddle boards and we spent the rest of the day swimming and playing on the slide. It was a really good day and the slide was so much fun! Our boat docked in Stonehaven for the evening and we just chilled and drank (quite a lot of chill time on the boat). 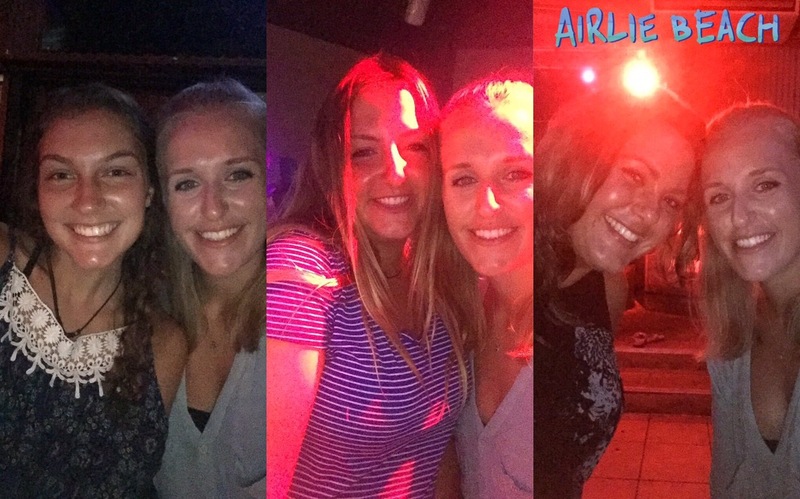 There was flashback music on from our youth like Spice Girls and S Club 7 (you can see the boat was mainly girls) and the crew had the lights of the boat flashing along with the music. 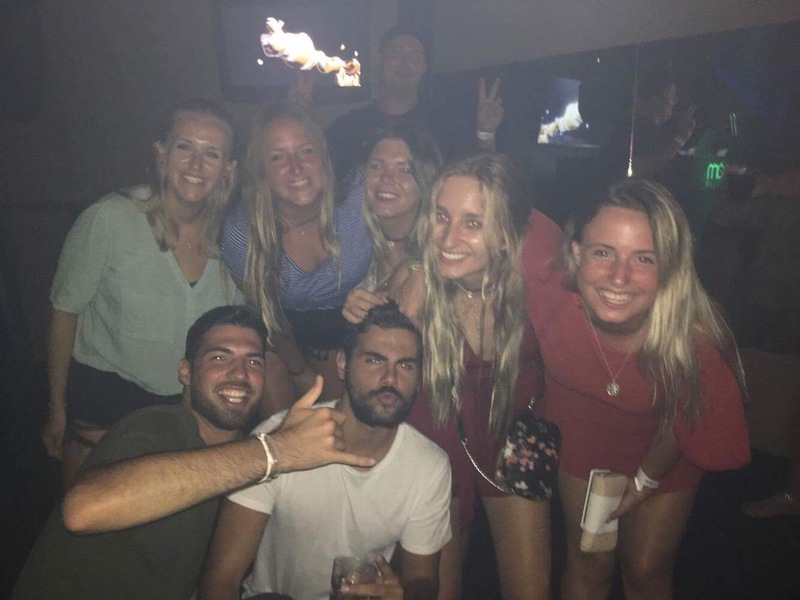 It was our last night on the boat so everyone was up for more of a party including the crew that got us playing a drinking game called sink the ship. The game involved a big bowl full of water and a smaller bowl balanced on the water which you poured the goon (boxed wine) into. You had to close your eyes and poured in the goon and whoever made water tip out of the bowl had to down the goon. It was a good game to get everyone involved and in the party mood. 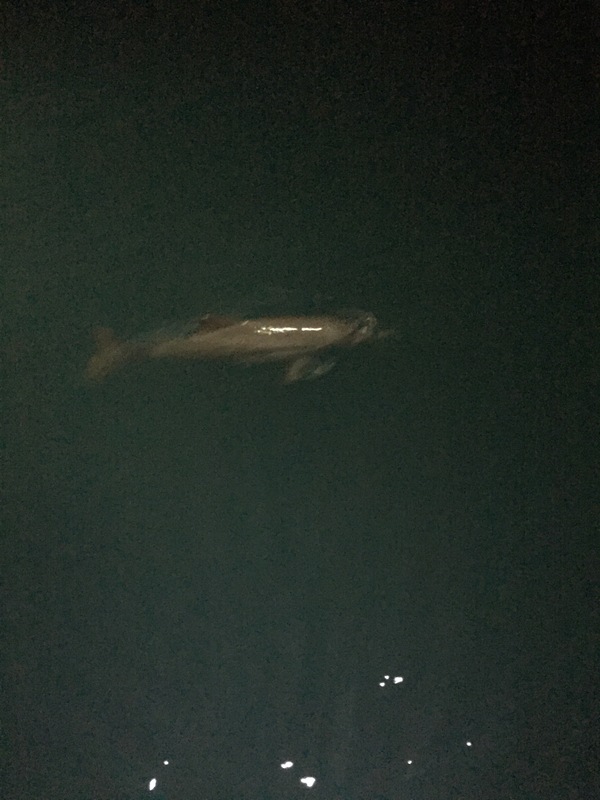 There were huge fish called bat fish in the water that night that were eating the squid that were floating around. You would see a splash and then a pool of black ink where the squid had been eaten which was cool. 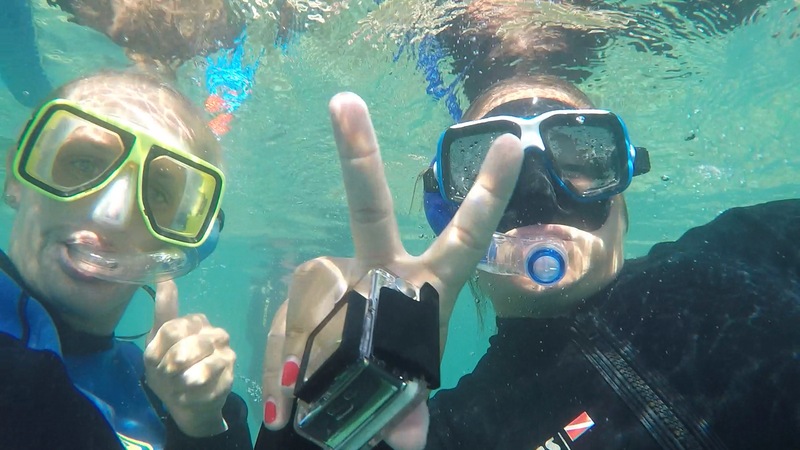 Our last morning was another early one to get in some snorkelling and swimming before heading back to the mainland. 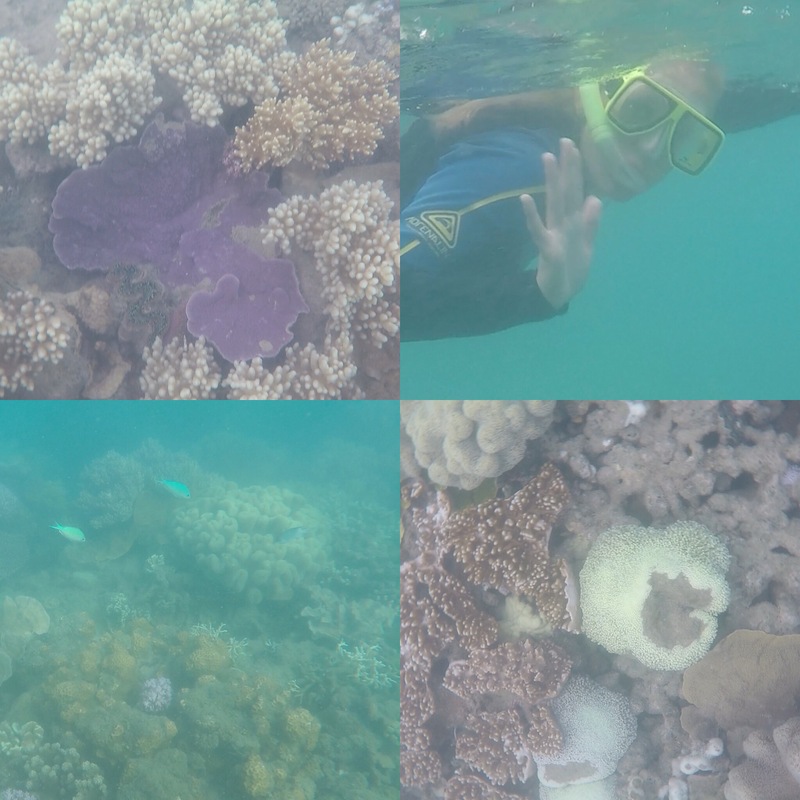 The water wasn’t as clear as the day before because it had rained in the night so the snorkelling wasn’t as good. 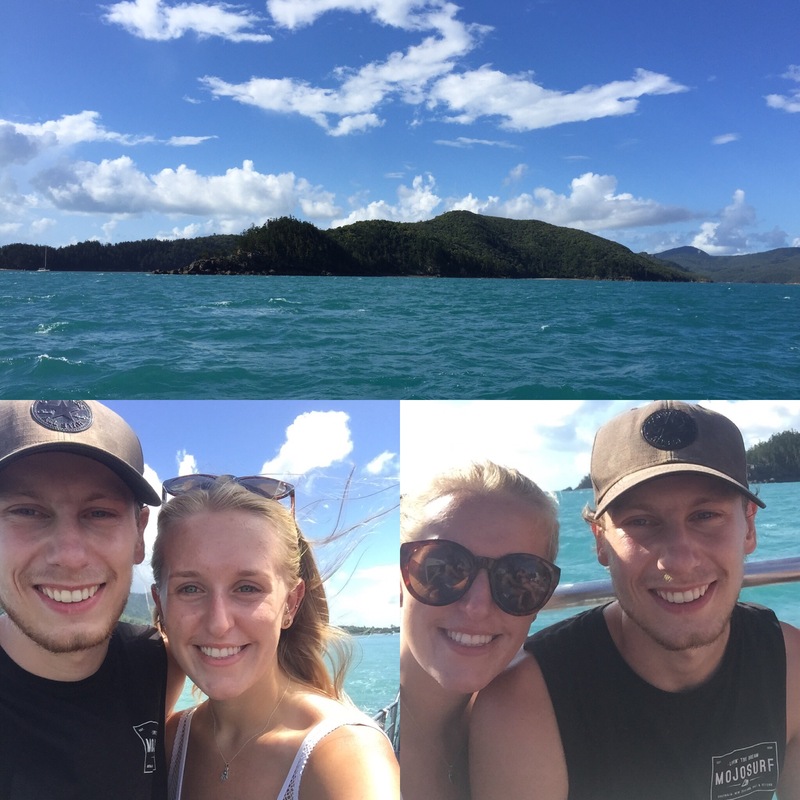 On the boat back to Airlie beach I got very sea sick and was actually sick off the boat which wasn’t great – it was a very rocky boat back! 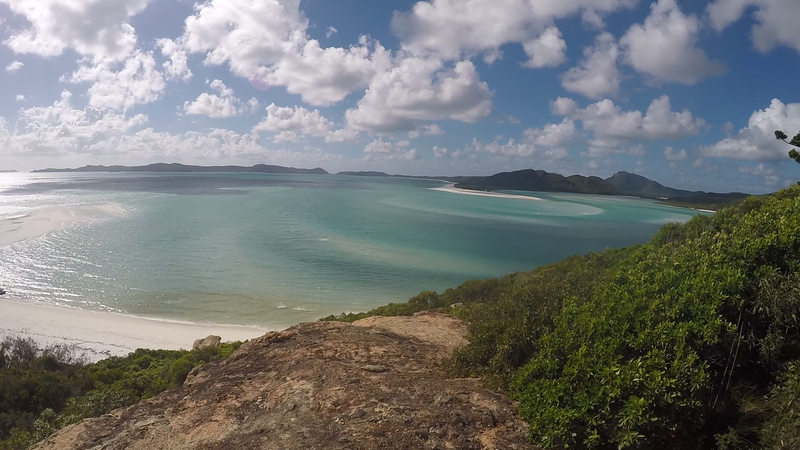 We met some lovely people on our Whitsundays trip and had a good time. It’s a good thing to do just for what you see, it’s so beautiful out there and the marine life is fantastic. 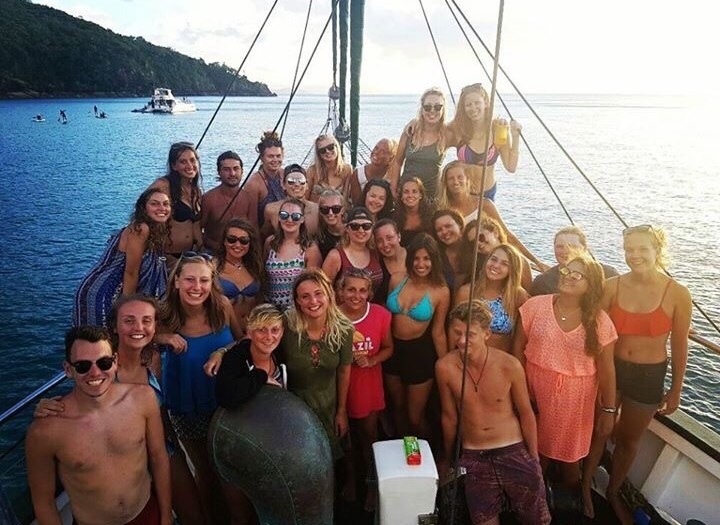 The range of boats means that there is something for every age and interest from sailing and fishing to partying. And a lot of it is about having a nice group of people (all you can do is hope for that) seeing as you’re on a little boat with them the whole time! When we got back to the hostel, our friends Lucy, Annie and Kelly had already got their dorm room so we asked the hostel to be put in a room with them and they let us. We relaxed the rest of the day with everyone except me having a nap. All boats have an after party the night they get back on land and our boats were no exception to this. We went to the bar around 8ish and had food there as being on the boat got us discount. 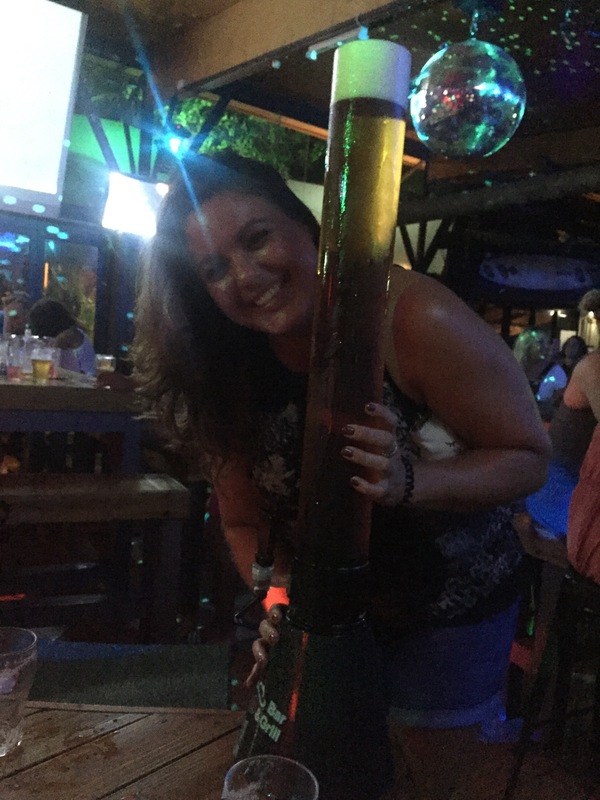 There were loads of free jugs of cocktails and then some people from the boat started buying huge tubes of beer (I don’t know how to describe it so please see the picture of our friend from the boat, Charlotte, for reference). We went to a club called Boom where we had free entry. It was a really good night with everyone so I’m glad we went out. We also saw Jess, Amber, Stacey, Naina and Abby whilst we were out which was good to hear how all of their boat trips went. 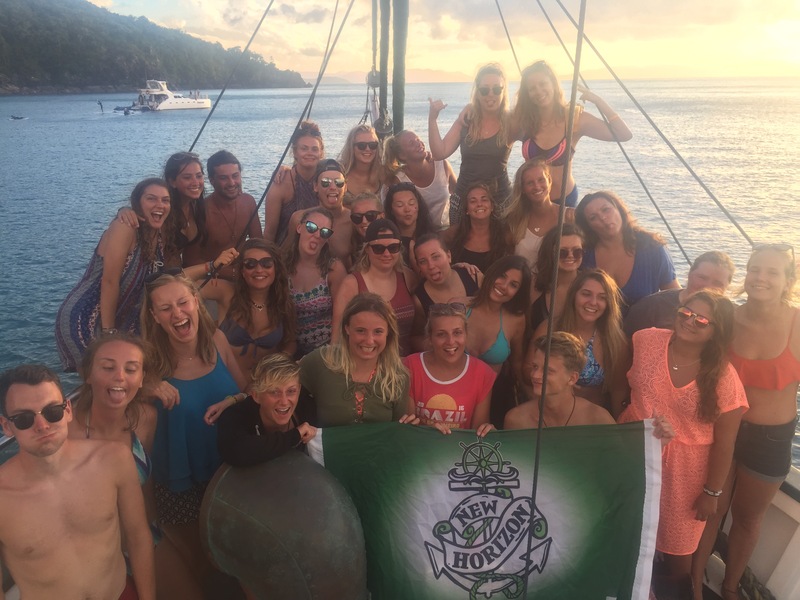 Jess was on a boat called The British Defender which was a conveyer navy ship and the girls had been on a boat called The Ride to Paradise where you stay on a fancy resort at night instead of on the boat (I told you, boats to suit whatever you want!) Jed, a member of the crew had also come out to see us all which was nice, although that may have also had something to do with one of the girls from our boat being out with us if you catch my drift. The whole experience was a great one and I’m really glad we did it. 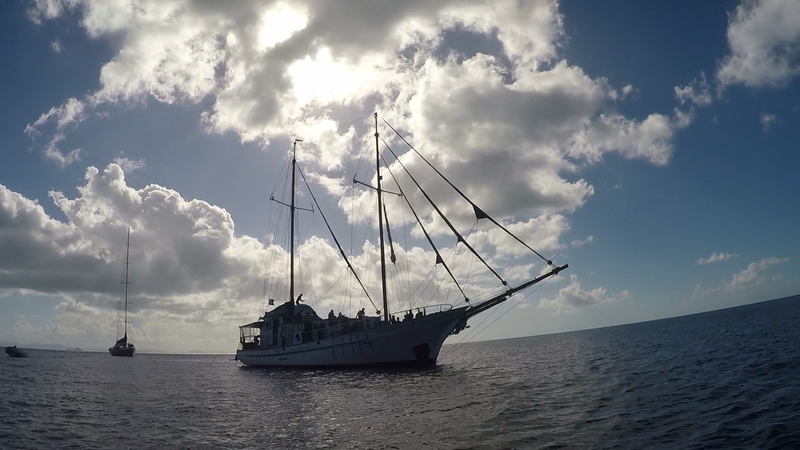 It was so cool to live on a boat even if I did get sea sick!